When people think island vacation they tend to think Caribbean. Many also mistakenly believe that Bermuda is located in the Caribbean. While those southern islands have plenty to offer, Bermuda, off the coast of South Carolina, is its own special place. We thought it'd be helpful, especially to those unfamiliar with our beautiful island, to do a Bermuda vs The Bahamas comparison. A simple search of two of the largest international east coast airports will show you that Bermuda is the closer destination. Shorter travel times mean longer vacation time! While the island of Bermuda is situated in the open water of the Atlantic, it is also bordered by three different sounds (Great Sound, Little Sound and Harrington Sound), all of which provide calm waters perfect for a lazy day at the beach. In the Bahamas, your waterfront experience varies greatly depending on your location on a given island. While the Caribbean tends to be calm and tranquil, troughs dug to allow larger cruise boats to travel through make for rougher waters on the Atlantic coasts and an ocean floor that drops steeply before you even get too far in. One final, and probably most notable, aspect of the beaches is the difference in the sand. Around the world Bermuda is known for its pink sand beaches. This hue is no trick of the eye, it's actually a result of the shells of a tiny organism called the red foraminifera, which has a red coloring that mixes with the white sand by way of the waves. You will find some pink sand in The Bahamas, however, it is only on the Bahamian out-islands: Eleuthera and Harbour Island. Beyond catching some rays and going for a swim, both Bermuda and the Bahamas offer some spectacular underwater landscapes to explore. Bermuda boasts 7 major reef dive spots around the island, the majority of which are navigable by beginners but equally enjoyable for the seasoned underwater explorer. The dives surrounding the islands of The Bahamas focus more on walls and blue holes. 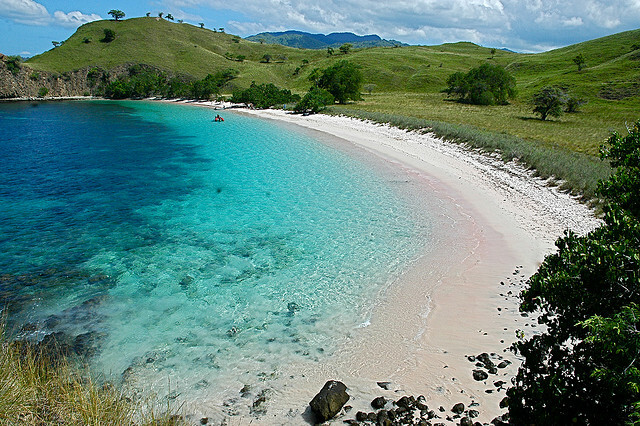 Neither of which (while beautiful and fun to explore) are viable options for amateur divers looking to do some relaxing underwater sight-seeing. Wall diving is not for beginners, due to their vast size, depth and, occasionally, the requirement to "drift dive." "Walls are found throughout The Bahamas and their profiles range from those that end at sand bottoms 60 to 100 feet deep, to seemingly infinite vertical descents." Blue Holes also litter the islands. Unfortunately, access to these dive spots varies from organizational to governmental control, with some sites being strictly off limits. "Blue holes are a phenomenon created during several ice ages, when sea levels were 400 feet lower and The Bahamas was a great exposed limestone platform. Centuries of acidic rain water etched into the vast bank, creating circular depressions and other magnificent formations." 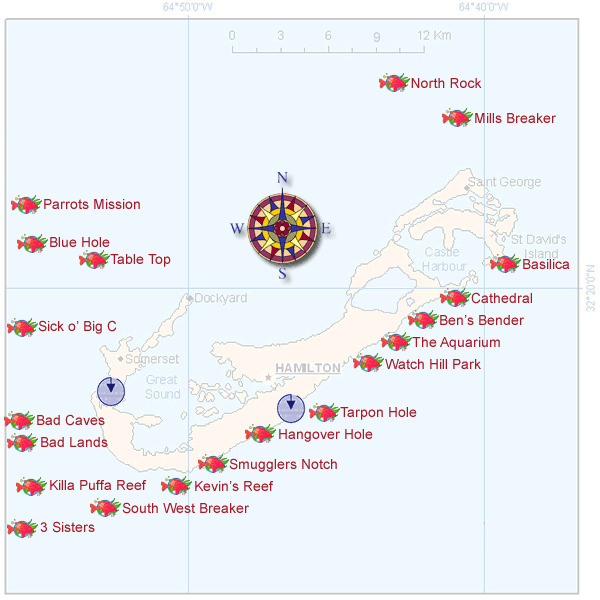 Bermuda boasts no fewer than 20 wreck sites, including some locations that date back to the late 19th century. The wrecks each have their own personality, some acting as a haven for wildly colored fish and others creating a base for massive coral formations. Wreck depths range from 10 to 80 feet below the ocean's surface, allowing for exploration by snorkel or scuba. The Bahamas boast a number of wreck sites, although they are spread between all of the country's islands. Where you choose to visit - Grand Bahama Island or Nassau/Paradise Island - determines whether you'll have 7 or 16 shipwrecks within reach. Beyond considering travel time, the beaches, the underwater adventures and many other exciting experiences available when comparing Bermuda and the Bahamas, possibly the most important aspect is the overall vibe of the location. 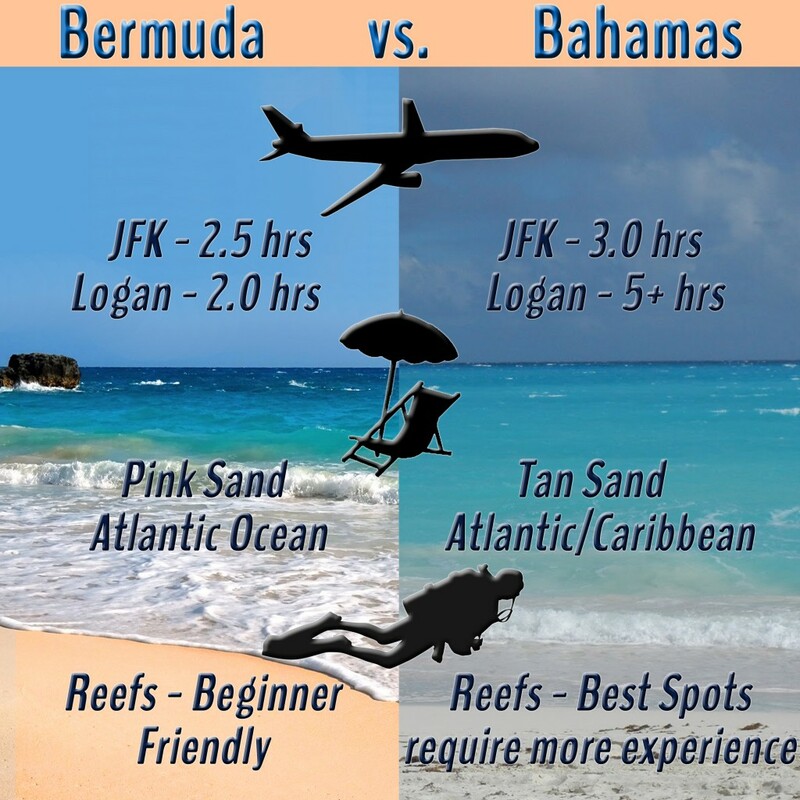 The Bahamas has a great deal to offer visitors, though it could be argued that the differences between the same types of experiences is what makes Bermuda so unique. What you won't find in Bermuda are endless streets and beach vendors hawking unoriginal souvenirs, trying to convince you to get your hair braided or ride the jet ski; nor will you find evidence of corporate chain stores offering the usual selection of goods. What you will find is a peaceful island with a sense of privacy,security and a community of people who are happy to answer your questions rather than sell you a t-shirt. Have you had a chance to visit both? Share your thoughts and comments with us.